This article is about the city. For the hold, see Winterhold (region). Winterhold is a city located on the northeastern tip of Skyrim and is home to the prominent College of Winterhold. It was once a large, bustling and prosperous city. In 4E 122, a cataclysmic event known as the "Great Collapse" occurred, in which most of the city fell into the Sea of Ghosts. Winterhold now only consists of a few rudimentary buildings and the College of Winterhold, one of the only original structures still standing. Many of the remaining inhabitants of Winterhold suspect that the College caused the city's destruction. The College stands by the belief that it was caused as a result of the earthquake in Vivec and subsequent eruption of Red Mountain in Morrowind. The few remaining residents of Winterhold can usually be found "drinking their sorrows away" in the Frozen Hearth, and most of these characters can point you to local quests. Birna at "Birna's Oddments" can also sell you the Coral Dragon Claw for 50 septims, which you will need to investigate Yngol Barrow further. For historical information about the city, see the lore article. Dagur The Frozen Hearth Drowned Sorrows: Find Isabelle, Ranmir's lost love. Winterhold is set to experience a 100% chance of snowfall. It will always be snowing even if the Clear Skies shout is used. There is no jail in Winterhold. Instead, criminals are exiled to a cave far to the north of the town called The Chill, guarded by four frost atronachs. Guards will also mention this when you agree to go to prison by saying "Ha. Enjoy the Chill." 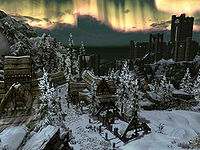 With the Hearthfire add-on installed, Winterhold is the only hold where you cannot buy or buildHF a house. As a result, it is also the only Hold where you will not be offered the services of a housecarl, even as a bodyguard. Random soldiers of the opposing civil war faction may spawn near the town and attack the guards, if you aid them in killing the soldier it will count as an assault or murder, and they will turn hostile and attack. When paying a bounty in Winterhold the guard will mention that stolen goods will be confiscated. However no items will actually be lost as there is no evidence chest anywhere throughout the hold. 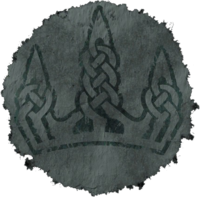 In Skyrim Special Edition, stolen goods are removed when paying a bounty in Winterhold and are sent to the nearest Evidence Chest - in Dawnstar. However, stolen goods will not be removed when being sent to The Chill as Winterhold itself still lacks an evidence chest. ? This page was last modified on 13 January 2019, at 13:16.